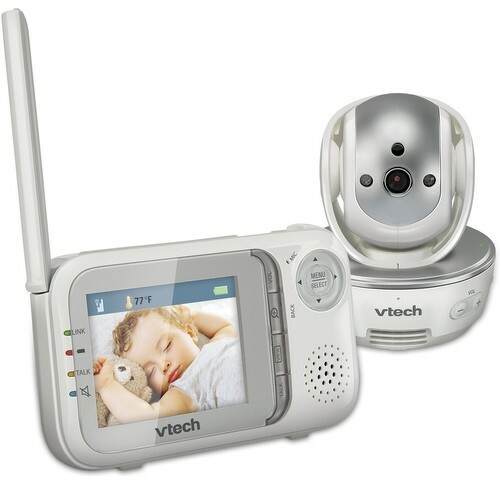 I can’t believe I’ve gone so long without this VTech® video baby monitor! It has everything needed to put a mom’s mind at ease. It’s packed with everything a mom needs – a portable parent unit with a rechargeable battery, a beautiful design, and of course peace of mind! The flat antenna is durable and won’t break easily. the stand is simple and so easy to open or close. With the Safe&Sound® Pan & Tilt monitor there will be no more suspicion when your baby is too quiet… You’ll be able to see for yourself what he or she is up to from anywhere in the house! You can purchase multiple camera units and switch between them from the parent unit. The device is so easy to learn, it’s great for those who are not technologically skilled as well. If you’re watching a little mover, you’ll love the pan, and tilt on this monitor! You can control the camera from the parent unit, panning 270 degrees side to side, 124 degrees up and down. Temperature readings, plus alerts when it passes the temperatures you set. Vibrate option- so you can get silent alerts when baby is making sounds. Visual sound indicator so you can mute it and see when baby’s making noise. Digitally transmits sounds and video with this 2.4 GHz system. I’m in love with this monitor. My baby has a very difficult time sleeping. Before I had it, I kept checking up on him to see if he’d fallen asleep yet. Sometimes he would see me and that would ruin his nap. Now, I can see on the monitor if he’s okay. If he’s crying I can shush him using the intercom without upsetting him and making him want me to hold him. He naps much better since I started using it. I wish I’d had it sooner. I think this is a must have for every new mom, and a perfect gift. Who doesn’t want to be given the gift of peace of mind? This little device is a life save especially when your trying to get dinner ready and the baby is upstairs sleeping. It makes life for a busy mom so much easier. I absolutely love vtech products they rock! I love that it gives your room temperature readings and it has infrared for night time use. This is just such amazing technology. I’m not such what I would like best, the pan or the close up features. In my day it was run and find out!! i like that the batteries are rechargeable, if they weren’t it could cost a fortune to keep it running. I like the Temperature readings feature. I Like The •High resolution 2.8 inch color LED screen Feature! I love the pan and tilt feature! so many of the monitors are stationary and if your little one moves around they get out of view ..so having these features would be wonderful! ty for the review!! My favorite feature is that you can see the baby without lights waking the baby up. This monitor sounds absolutely wonderful! There are so many great features! I love that you can speak to the baby through the talk back feature and that it’s a color picture monitor. my fav feature is Multiple viewing options. I love that it has temperature readings and alerts. My little one still sleeps in the room with us, but we plan on moving him into his own room in the next few months. We’ve been debating about which monitor to get, but the choices are very overwhelming, so it’s nice to see a personal review of this one. It sounds great, and is now easily first on my list! Thanks for the review! I like that it has video display and I think the talk back button is a terrific idea. I really love the intercom feature. i love the pan/tilt, and the talk back feature. 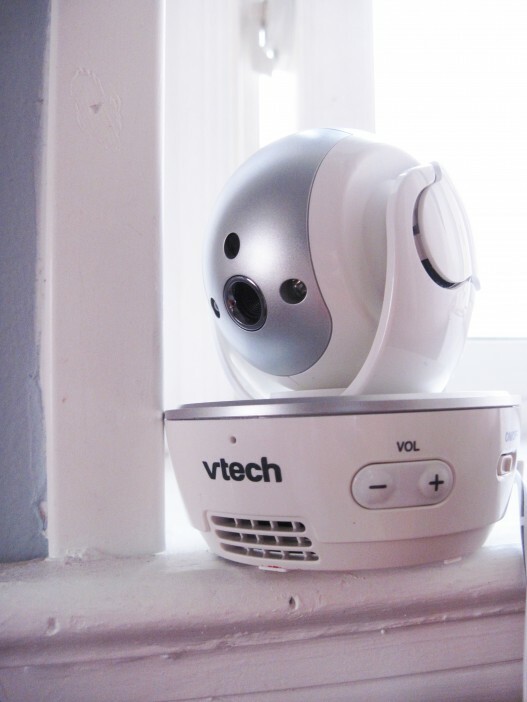 My favorite feature is the Infrared LED so you can see your baby at night with no disturbing lights. I really like the Vibrate option so you can get silent alerts when baby is making sounds. I think thats a great feature. Love the use of the intercom to comfort the baby. Great product! I like the intercom feature. My favorite feature is that you can control the camera from the parent unit — also nice that you can zoom and pan with it. My favorite feature is the multiple viewing options to see different angles! I like the temperature read on it. I like the intercom and the zoom. I like that this has a talk back button a feature that can come in handy. I love how I could move this. It would be great for keeping an eye on my little guy! I like the infrared for night viewing without the need for lights. I love the intercom feature and that you can use multiple cameras. This monitor sounds amazing! i need this for my new baby coming! it looks great!!! I love the talk back intercom button. One of my favorite features is the fact that you can zoom in from the parent unit and I really like the talk back intercom button! thank you! i love 5that you can control thew camera from the parent unit, that’s awesome. my bestie needs a monitor, this would be great. I like many of the features on this. First is that it won’t disturb baby by a light being on. Second, I like that it has a temperature read on it; I’m always wondering if it is too hot or too cold. And, lastly, I like the zoom in feature just in case I have any worries. Thank you for sponsoring this giveaway. Wow, I’m pretty impressed with this monitor. I really like that it has a temperature reader on it and that you can talk on it. I love that you can turn where its looking! I like all the options but my favorite is the pan & tilt feature!